After a prequalification process, customers access and book rentals through the Skurt app. Photo courtesy of Skurt. Skurt, a transportation service that delivers rental cars, has raised $10 million in Series A funding, according to a report by Tech Crunch. The round was led by Upfront Ventures and included an investment from BMW, as well as funding from Troy Carter’s Cross Culture Ventures, Expansion VC, Greycroft, and Magic Johnson, says the report. 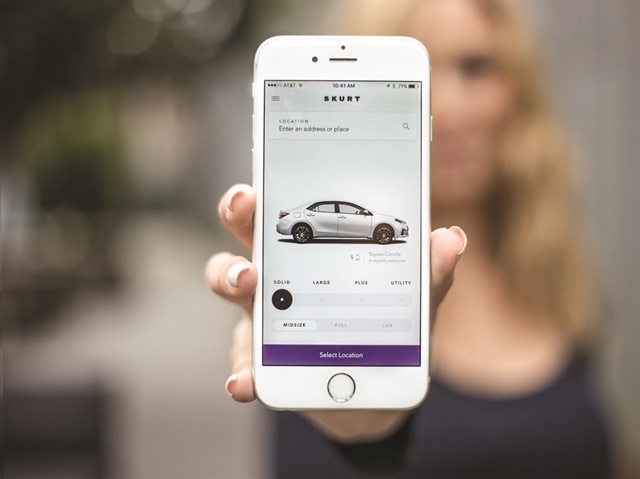 Users request a rental on their smartphone and Skurt delivers the car to them within 60 minutes of booking. When they are finished with the rental, someone from Skurt comes to get the car wherever they are, according to the report. Skurt fills its vehicle inventory by partnering with car rental companies, auto manufacturers with excess inventory, and dealerships. Launched in October 2015, Skurt currently operates in Los Angeles, Orange County, Miami, and San Diego.